I did a personality assessment that said I tend to exaggerate. Moi?? Never! That's preposterous. I cannot fathom that I would ever exaggerate for the sake of, say, storytelling. You can rest at ease now, knowing that I didn't in fact die and probably wasn't close to death but I have to hook you somehow. Being from the prairies, we hadn't experienced much of what coastal life was like. It smells kind of gross, and the wind, let's just say that the Cape Doctor (their name for a very strong wind that is perfect for growing, cleaning, healing, and ripening the vineyards) puts prairie wind to shame. 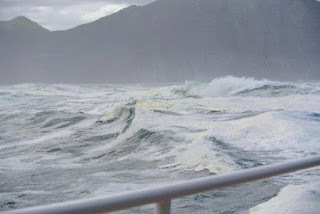 With that wind, the ocean can get a little tumultuous at times. Add to that, that Cape Point is where two oceans meet and it gets down-right dangerous. It's like a whirling jacuzzi filled with jagged rocks and animals that would gladly bite you for sport. Naturally, the hubster wanted to go shark diving. You will laugh at this later, I promise. I was over-joyed to find out that while we were there (February) the Great Whites are not as abundant as they are swimming north for warmer waters. there weren't any shark diving adventures available at the time. February is fall and as the weather starts to change so does the ocean. One Sunday we took Scoots (our name for our faithful little 2 cylinder scooter) over to Hout Bay. I had bought our morning tickets in advance because the "afternoon excursions are often cancelled due to harsh conditions". Red flag number 1. 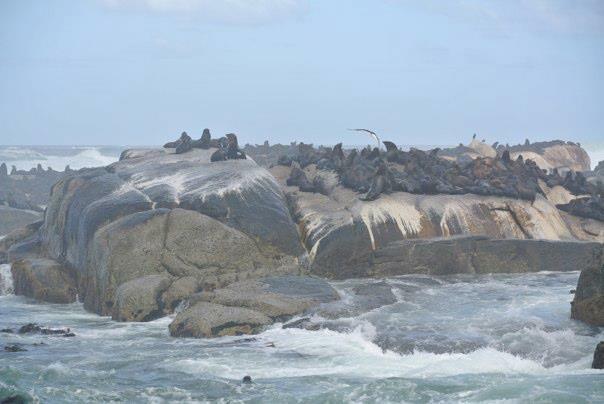 Hout Bay is the largest gathering of Seals, there are some 60 000 at any given moment. This is often the place that shark diving occurs because it's fish in a barrel (rather, seals in a bath tub) for the sharks. We lined up at the dock, and some people looked a little green disembarking. Red flag number 2. I overheard a man with sea legs saying to people to stay near the middle or back of the boat if you have a tendency for sea-sickness. Red flag number 3. We boarded the boat and the hubster started running for the front. I grabbed his arm and said, we will stay here. He apparently didn't hear the gentleman on the land telling us to stick to the calmer portions of the boat, we sat on the port side with access to many rails. The harbour was calm and surrounded by large mountains, truly picturesque. We trolled along, and for a brief moment I thought, hm, no waivers, we are definitely in Africa. The radio squawked something about life jackets being inside under some benches and to hold on to a railing at all times. Red flag number 4, 5, 6... I'll stop with this now. We hit the open water slowly and felt the boat rock a little. We turned and passed another sight-seeing boat and a man was holding his arm out and moving his hand in a "so-so" fashion. I thought, rats it's a dismal showing of seals today. Then our boat hit it, I could hear the engine chugging hard and it felt like we were racing. The radio cracked on and told people at the front to hold on and secure their belongings or move to the back of the boat. Suddenly, the engine cut, and all I could feel were the waves hitting the other side of the boat. We were pitching and yawing. Prairie translation: one second we were looking at the sky, the next moment the sea. It felt like we were on a fair ride that turned you upside down. I of course went into shock. With a reflex response, the hubster's arm stretched across me to keep from falling off the side of the boat. I gripped onto the pole that ran alongside me for dear life. The rocking settled, the engine roared and we went about 20 feet, then the engine was cut again, the sky-sea-sky-sea sights flashed. The man's hand suddenly made sense, it wasn't a so-so experience, he was mimicking the rocking of the boat. We continued this pattern for the next 20 minutes. These are not stock photos, these are my own, and the perspective does not do it justice. The waves were easily a couple of meters high. When we pulled up to the seal rock, the speaker crackled to life with some barely intelligible words coming out. 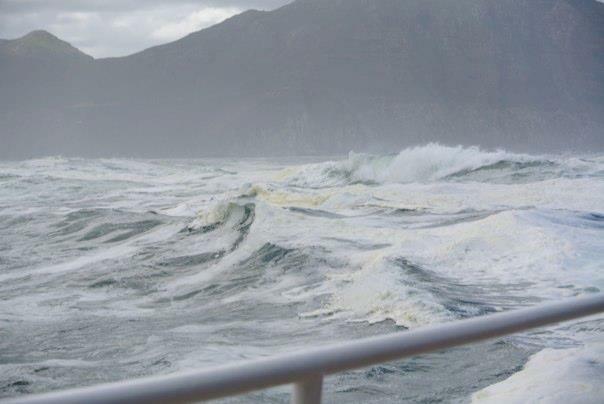 My head was full of cotton, my hands shook as we walked through the boat to snap a few shaky pictures of the seals playing in the frothy, roaring sea. That's when I noticed the hubster was trembling. His face and hands were white. His eyes were huge. We were both realizing that the trip home would be the same journey. It was as though a flip switched, I immediately became courageous and was reassuring him that these were seasoned seamen who had fished and boated in these waters and that this was any given Sunday for them. I told him that I would like to ride inside the boat on the way home because I didn't think I could handle it outside any more. The relief washed over him. We barely looked at the seals. We just went inside and comforted each other. He found the life jackets, and I found a pole. I held on to it as the engines roared to life and we made the turn toward the harbour. We laughed and let the ship rock, aghast at the insane tourists that stayed near the front of the boat. 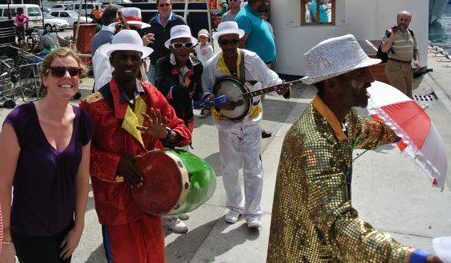 We arrived back at the dock to toothless men dressed in red, white, and gold with drums and tambourines singing "When the saints go marching in" spinning an umbrella. I wondered if they have to do that to sugar coat the entire terrifying experience. I laughed in the face of death and danced with the men singing about our triumphal return, who knows if they sing lost at sea ballads as well. Trembling, we had to shop at the booths that were setting up shop to get our land legs back before we could hop on Scoots and vow to never do that again. But we did, on our second anniversary, and that is a story for another day.